Durga puja is just a few days away. Every street of Bengal and other parts of India will be filled with people and food stalls. Among all of them 'chaat' stalls are my favourite. I like various type of chaats like panipuri, dahi puri chat, papri chat, samosa chat, nimki chat, batata puri chat, ghugni chat and so on. 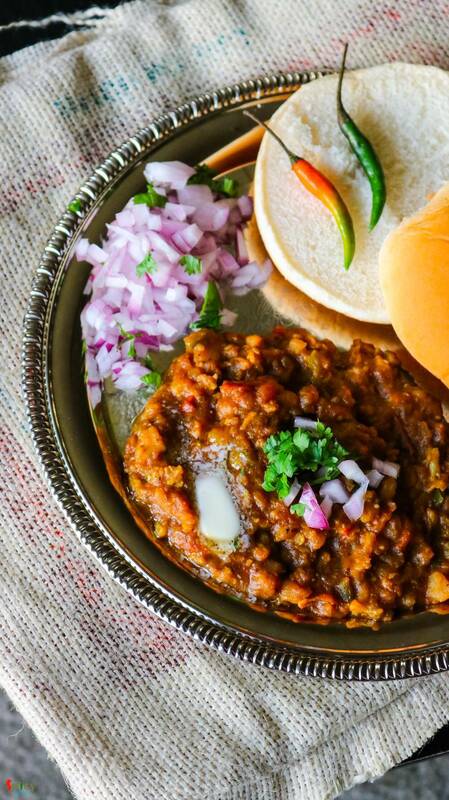 Though today I am not sharing any Bengali chaat, but 'pav bhaji' is quite famous in Mumbai and many other parts of India. 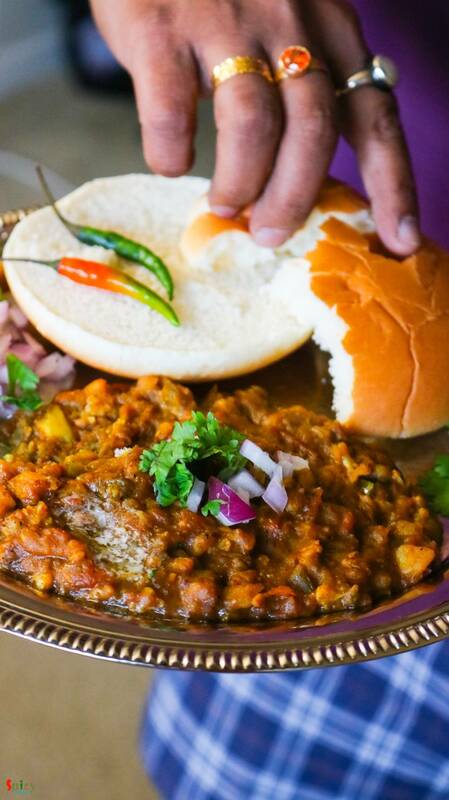 'Bhaji' indicates spicy, tangy mashed vegetable curry and 'pav' means bread / bun. 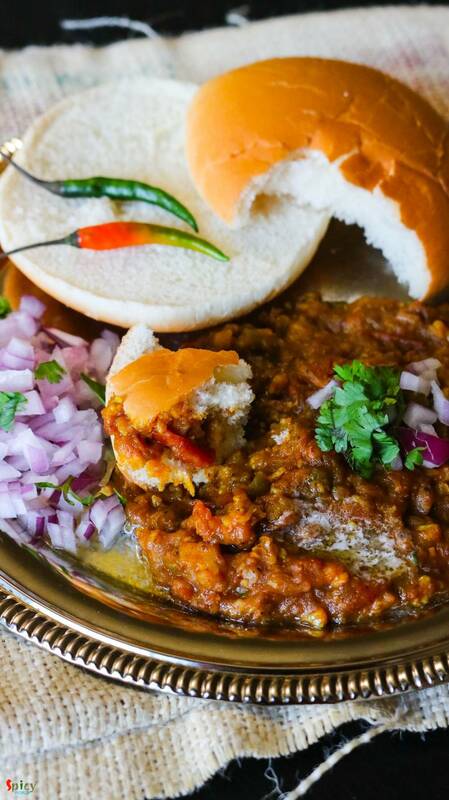 After having a plate of 'pav bhaji', don't ever forget to have a cup of milky tea ... trust me on this one. Before start cooking this dish, you have to remember one simple thing - Butter makes everything better ! Do try this recipe in your kitchen and enjoy a great evening with your family. 1 big potato, boiled and mashed. 4 Tablespoons of chopped capsicum. 1 cup of boiled mix vegetables (carrots, cauliflower, green peas, beans). Spice powder (2 Teaspoons of roasted coriander powder, 1 Teaspoon of roasted cumin powder, 1 Teaspoon of garam masala, 1 Teaspoon of fennel powder, 1 Teaspoon of turmeric powder, 2 Teaspoons of hot red chilli powder, 1 Teaspoon of black pepper powder, 1 Tablespoon of kashmiri red chilli powder, pinch of amchoor / dry mango powder). Place the butter in a flat pan and then turn on the heat on low. When the butter melts down completely add the green chilies, ginger and garlic paste. Mix for 2 minutes on medium flame. Then add chopped onion with pinch of salt. Cook until it become golden in color. Then add the chopped capsicum. For more color, you can also use red bell peppers. Cook for another 4 minutes. Then add the chopped tomatoes and some more salt. Cook this until it becomes mushy. Now add all of the spice powder or store bought pav bhaji masala. Mix well for 3 minutes. Add the boiled vegetables. Mix well and mash them a bit with a masher. Then add mashed potato, salt and a big pinch of sugar. Mix very well. Make a little hole inside the pan and add a cup of water. Mix everything slowly for 3 minutes. Now mash everything very well with a masher. If you like your bhaji on thinner side, then add some more water and cook for another 15 minutes. Lastly add some chopped coriander leaves and turn off the heat. In another pan toast the buns with some butter. 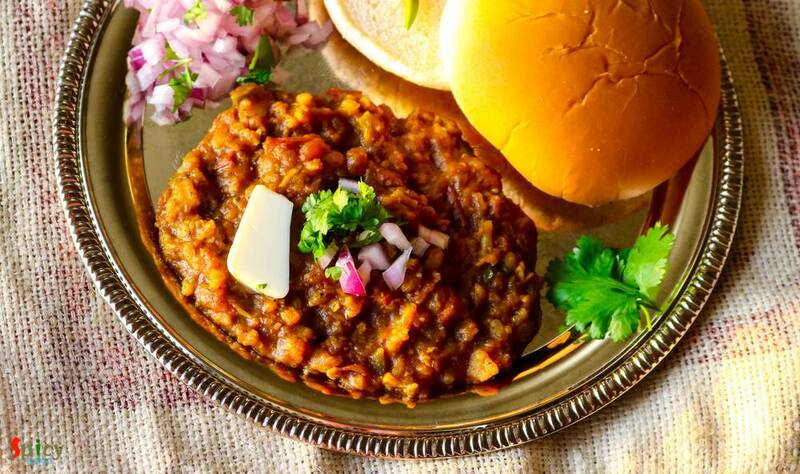 For serving place the 2 pavs in a plate, put some bhaji and some chopped onion. Enjoy this hot with a dollop of butter ..